Summary: The bulk of this project is the procurement of an in-house blood chemistry analyzer, cartridges, and expendable supplies for use at Mote Marine Laboratory’s Sea Turtle Rehabilitation Hospital, with additional funds for minimal salary support. Currently analyses are conducted at Sarasota Memorial Hospital, requiring someone to deliver the samples and waiting to receiving the results at a rate of $44/screen. 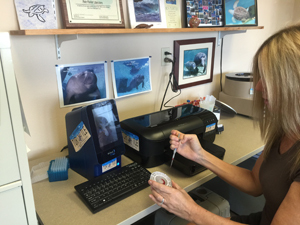 An analyzer within the hospital will allow for more efficient care of sea turtle undergoing rehabilitation.